South New Brighton Park has a fantastic new playground – it’s hard to know what to play on first! Most kids seem to make a run for the dramatic looking rope super-structure. 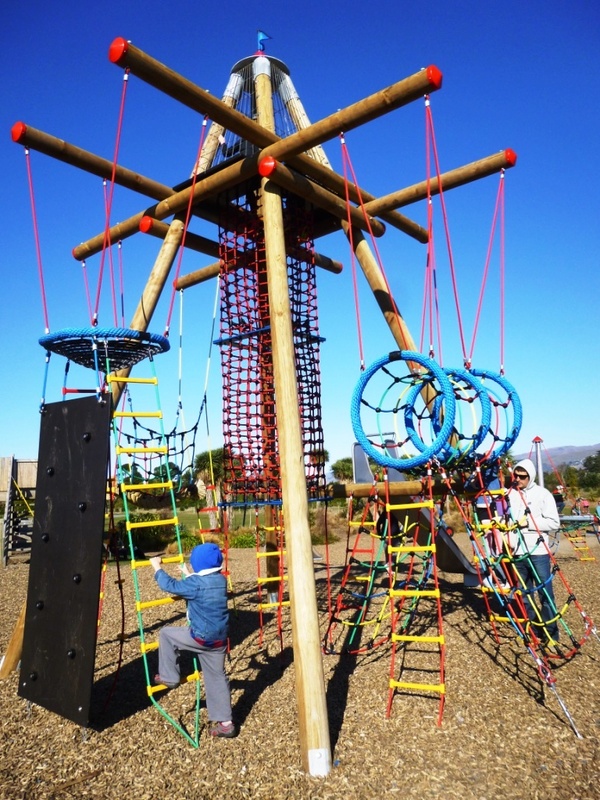 There’s a lot of variety in the clever new play equipment that will test and challenge kids of all ages. The park also has a flying fox, basketball court, small skate area, and brand new toilets. While you’re there, check out the estuary and stunning views back towards the Alps, and take a walk down the jetty. We’ve also flown kites here quite successfully in the past. Access is via Beatty Street – drive in past the South Brighton Community Centre. See location map below. We visited South New Brighton Park in August 2015 (winter). We visited again in September 2017 (spring). It’s still a very cool playground, and the South Brighton boardwalk that is currently being rebuilt nearby will enhance the area further. Nice, must go check it out with the kids. Glad they fixed the Jetty, last time I was there it as blocked off & not safe. Good Job. Thanks for the directions to this fabulous playground. Both kids and parents loved this playground 🙂 Stunning view of sunset from the top of climbing frame. Lots of variety of playground equipment. Great to have toilets on site too. Highly recommend!